We are based in South Wales, near Newport. We do not run taster classes because we know that one class/session only cannot help you. It is necessary to participate in at least in 4 sessions to start to see and feel the results of Tango Therapy. But we do demonstration workshops of the technique and they are usually free. We recommend visiting our NEWS menu were you will find when and where will be the next one. We work very closely with PDS (Parkinson’s disease Society), Alzheimer’s Society and similar charities or organizations. They usually organize events in where we participate doing demonstration workshops. We suggest you contact a representative of one of them in your area to see if it is possible to organize one. We will be happy to go for free; we only need to cover our travel expenses from Cardiff, Wales. Can I go to a Tango Therapy session that is already running? Tango Therapy sessions are not like a Tango class or Milonga (the place where the people go to dance tango). The sessions are developed especially for the group and their needs. Each group is different; some need more sessions, some others less. The tango lessons are prepared in order to help them to learn in a gradual way, according with their needs. Also we include special exercises as a complement of the tango practice. The participants will increase their skills slowly and it will not be possible for a new participant to follow the sessions. Is a Tango Class similar to Tango Therapy sessions? I tried to go to Tango classes in my area because I understand that Tango dance can help me with my problem, but I found those classes complicated for me. Why is Tango Therapy different? Some media published that Tango is very good for some diseases such as Parkinson’s, Alzheimer, the Elderly, and more. They said that there are several studies that confirm this. This is true, but they do not publish the full research and its results. This confuses people and makes them believe that all tango classes can help them. This is not true. In fact, for some problems, a normal tango class can make the situation worse or, in the best case scenario, not help at all. Why? Because the normal tango classes are not developed for people with special needs. Tango can be a very complicated dance and usually includes figures and steps that are not suitable for everybody. Also a tango class is delivered by a tango teacher that works with a particular style. There are several styles in tango. A Tango Therapy session works with the styles, steps and figures that are suitable for each group. Also we include several complementary exercises that will help you in order to acquire the elasticity that you need to improve your condition and, at the same time, make it easy for you to dance tango. Can I continue practicing after the end of the sessions? I understand that the Tango Therapy sessions will end after certain of number of sessions (this depends of the needs of each group). Where can I continue with my tango practices after? After the Tango Therapy sessions most of the participants are ready to dance on their own and we encourage them to continue with the practices. Up to the problem that we treat during the sessions it is also highly recommendable that the participants continue with the practice of the tango dance. You can join a Milonga in your area. We will contact the local organizers in order to speak with them to know if it will be suitable for you and to know if they have the facilities that you need. The organisation that invited us and organised the Tango Therapy session maybe would like to keep the group in contact and they can organize Milongas. In that case we will be very happy to help them in order to guide them as to how to do that and also we can provide the music. If your partner was in the sessions you can continue with the practices in your home with him/her, if you do not have a partner probably one of the participants of the sessions wants to continue with the practices too and you can meet each other and have a good time dancing tango. We can help you and provide some music if you need it. 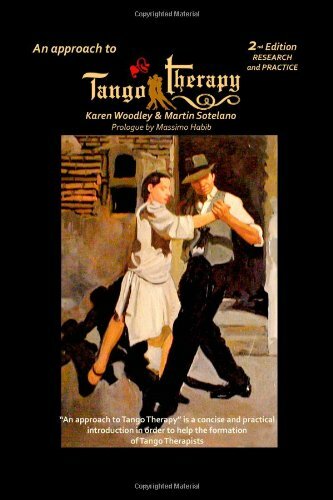 What can I do to learn Tango Therapy and to become a Tango Therapist? First of all you need to know what Tango Therapy means and which the options to work with are. A Tango Therapist can help with different types of diseases/problems and each of them requires a different training. We at Tango Therapy UK developed a Training Programme to work with people with physical disorders such as Parkinson’s, Alzheimer or heart diseases and the elderly. Please contact us if you want more information. Tango as a therapy is a new complementary therapy. Officially, no qualification is required but, we work very hard in order to be recognized as a complementary therapy and we are very close to reaching our goal. In the UK, we are looking forward to be recognized by the British Institute of Complementary Therapy and some courses will be accredited by them and by the International Association of Tango Therapy. As a therapist, we work with vulnerable people, it is necessary to understand what this means and what we can do to help them improve and rehabilitate their condition and not to make their situation worse. As a TANGO therapist, we, of course, need to know Tango, but we need to know more than one style of it and we need to understand that we are not going to teach Tango for people who want to go to a Milongas and dance like a master. We use tango as a pathway to reach our goal and our goal is to improve their health and wellbeing. Our experience shows to us that it is easier to become a Tango Therapist for somebody with some health-related background than for Tango Teachers. A Tango Therapist should know, according to the type of problems that they want to help to solve, several subjects like psychotherapy, physiotherapy, movement and dance therapy, and several other subjects, some of them are required by the law in order to work with vulnerable people. Regarding Tango, it is necessary to know different styles because we cannot apply the same tango style in people with Parkinson’s disease as well as people with depression. What are the elements of Tango Therapy?